Patterns are moving into carpets, and they’re not limited to florals or random shag patterns. Rather, the patterns being embraced in wall-to-wall carpets are clear, beautiful, and breathtaking. They add style to a room by taking the design theme all the way across the floor. Appropriate for traditional decors, they’re also a great choice for the modern look that graces today’s homes. Here are a few patterns that will simply take your breath away and add beauty to any room. In the past, floral patterns were artistic renditions that reminded you of a garden, but florals have moved to the next level. Now, you can choose a carpet with a floral pattern that is as clear and wonderful as a picture. The details and shading make you feel like you’re laying in the middle of a garden. The only thing missing will be the marvelous scents of your favorite flowers because these blossoms will never fade. Many patterned rugs embrace monochromatic themes, but you don’t have to settle for a few colors. Modern carpet makers are embracing the contrast of colors by mixing brilliant shades of black, tan, red and other colors together. The bold designs will dominate a room, so you can trust that your simple furniture won’t make the room feel too bland. With this centerpiece providing the room’s highlight, decorating the rest of the room will be incredibly easy. Luxurious wallpapers feature heavy detailing and bold colors. While you may have appreciated how they look on walls in the past, it probably never occurred to you that these patterns could also look great on the floor. Manufacturers are offering heavily detailed rugs with bold designs that turn your simple floor into an incredible work of art. Pair these rugs with contemporary furniture featuring solid colors and clean lines to keep the focus on the beautiful rug and enjoy the incredible look. Circles rotating inside each other and then resting on clean squares is just one of the geometric patterns moving to the forefront. You can also find geometric squares in contrasting colors that are softened with swirling patterns or falling leaves. The smart combination of geometric lines and swirling shapes adds beauty and a modern feel to any space. You can enjoy natural elements without going for heavy detailing. 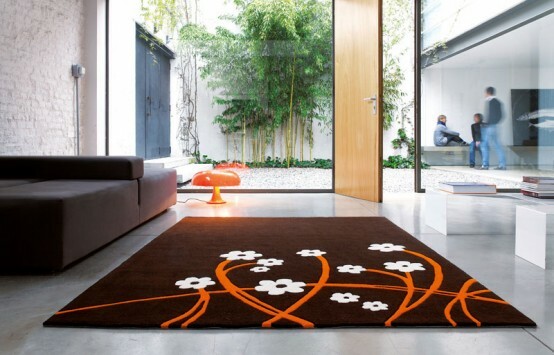 Look for rugs that feature images of random tree branches that are just starting to blossom. Improve the look of your home with dimensional rugs that look like a grove of trees or a close-up image of tree bark. Choose rugs with moving lines that look like water or swaying grass. There are countless carpet patterns to consider, and they’ll all add something special to your home. The modern look can be achieved with these patterned rugs, and you’ll love how the clean lines of your modern furniture stand out against these patterns. Keep your new rug looking great for years to come by trusting High Quality Carpet to steam clean it. We’ll treat stains, remove dirt and ensure that you can enjoy your carpet now and in the future.